The Department of Applied Physics of The Hong Kong Polytechnic University (PolyU) has developed a simple approach to synthesize novel environmentally-friendly manganese dioxide (MnO2) ink by using glucose. The MnO2 ink could be used for the production of light, thin, flexible and high performance energy storage devices via ordinary printing or even home-used printers. The capacity of the MnO2 ink supercapacitor is more than 30 times higher than that of a commercial capacitor of the same weight of active material (e.g. carbon powder), demonstrating the great potential of MnO2 ink in significantly enhancing the performances of energy storage devices, whereas its production cost amounts to less than HK$1. MnO2 is a kind of environmentally-friendly material and it is degradable. Given the environmental compatibility and high potential capacity of MnO2, it has always been regarded as an ideal candidate for the electrode materials of energy storage devices. The conventional MnO2electrode preparation methods suffer from high cost, complicated processes and could result in agglomeration of the MnO2 ink during the coating process, leading to the reduction of electrical conductivity. The PolyU research team has developed a simple approach to synthesize aqueous MnO2 ink. Firstly, highly crystalline carbon particles were prepared by microwave hydrothermal method, followed by a morphology transmission mechanism at room temperature. The MnO2 ink can be coated on various substrates, such as conductive paper, plastic and glass. Its thickness and weight can also be controlled for the production of light, thin, transparent and flexible energy storage devices. Substrates coated by MnO2 ink can easily be erased if required, facilitating the fabrication of electronic devices. 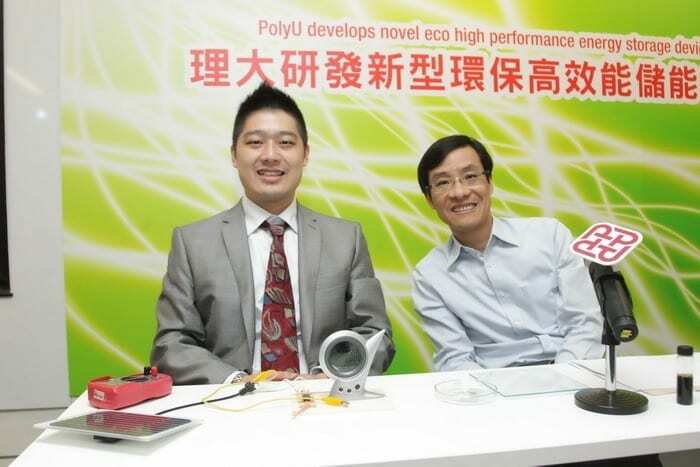 PolyU researchers coated the MnO2 ink on conductive A4 paper and fabricated a capacitive energy storage device with maximum energy density and power density amounting to 4 mWh•cm-3 and 13 W•cm-3 respectively. The capacity of the MnO2 ink capacitor is more than 30 times higher than that of a commercial capacitor of the same weight of active material (e.g. carbon powder), demonstrating the great potential of MnO2 ink in significantly enhancing the performances of energy storage devices. Given the small size, light, thin, flexible and high energy capacity properties of the MnO2 ink energy storage device, it shows a potential in wide applications. For instance, in wearable devices and radio-frequency identification systems, the MnO2 ink supercapacitor could be used as the power sources for the flexible and “bendable” display panels, smart textile, smart checkout tags, sensors, luggage tracking tags, etc., thereby contributing to the further development of these two areas. October 23, 2018 - 3D Printed Graphene Aerogel May Lead to Powerful Supercapacitors 3DPrint.comSupercapacitors are energy storage devices that charge very rapidly and can retain their storage capacity through tens of thousands of charge cycles. July 18, 2018 - Compact and flexible supercapacitor developed Printed Electronics WorldA lightweight, compact and efficient supercapacitor printed on a flexible plastic sheet has been developed by researchers.